The SR Smith Typhoon Pool slide is a small inground pool slide for those who have a small deck area. There are four different model numbers corresponding to the two different colors and whether it curves to the left or the right. Choose between right or left curve when buying SR smith Typhoon. Which one to purchase depends on your pool’s deck space and how best to utilize the space that you have. Maximum weight limit: 275 lbs. 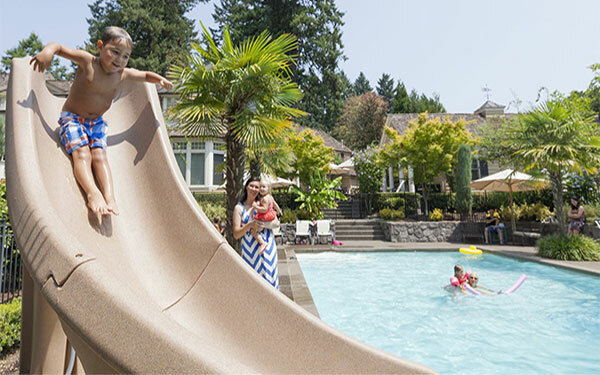 This inground pool slide is 7’4″ tall (6’51/2″ to seat). The flume is 9’10” in length with a diameter of 22″. It requires a deck space of 11’8″ x 4′. The handrails on both sides of the ladder are molded in using polyethylene. They’re a great feature specially for younger kids. The ladder has a 20 degree incline with 8 steps that are very easy to go up on. The flume which is 9’10” in length is made of thick roto-molded polyethylene. To make sliding down easier (and you don’t get stuck midway), there’s a 1″ PVC flex hose where water flows through. The flow rate is up to 20 GPM. The S R Smith Typhoon Water Slide is sold complete with the installation kit to get it ready for your outdoor pool. Simply choose whether you need a right or left curve slide. The package comes with all the pieces ready for construction. This slide is anchored to your pool deck with stainless steel anchor studs which are about (8) ½” (12.70mm) diameter. These studs already come with the kit. Here are the best places to buy S R Smith slide at the best price. Check them all out as they have discount offers every once in a while.